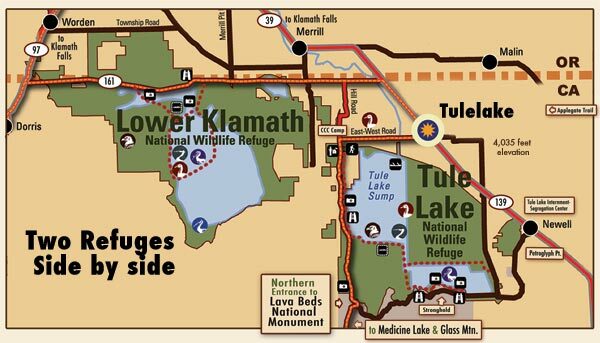 Lower Klamath National Wildlife Refuge is the Nation’s first waterfowl refuge. 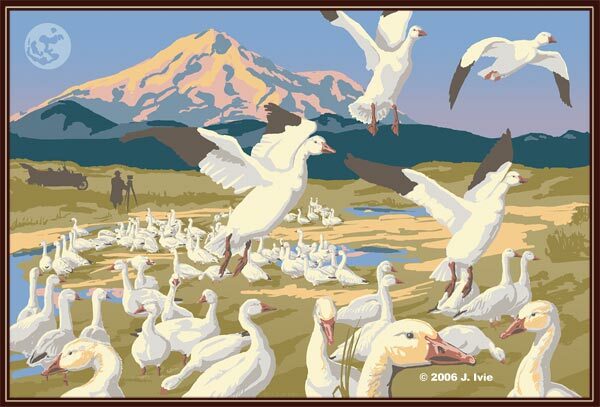 President Theodore Roosevelt reserved 81,619 acres of lakes and marshes along the California-Oregon border on August 8, 1908 as a preserve and breeding grounds for native birds. Here is the largest wintering bald eagle concentration in the Lower 48 states, “… we saw eagles everywhere… it was the closest we’d ever been to a bald eagle and perhaps, to each other…” Sunset Magazine. This 180 degree pan looking west from Sheepy Ridge at Lower Klamath National Wildlife Refuge includes shallow fresh waters, seasonal and permanent marshes, open water, grassy uplands and croplands. Before the Klamath Reclamation Act this was Lower Klamath Lake. Steamboats navigated from Laird’s Landing at the southern end of the lake north to Klamath Falls, Oregon. Both Tule Lake and Lower Klamath Lake started to be drained, reclaimed, as water was diverted and sent down the Klamath River. Brood-rearing by 200,000 ducks, geese, herons, egrets and grebes can be seen from May to August. August and September are peak months for viewing pelicans, egrets, herons and grebes. An estimated one to two million ducks and geese migrate through the basin each October and November and again in March and April. This is an excerpt from a speech by Steve Thompson at the Lower Klamath National Wildlife Refuge Centennial Celebration on August 8, 2008. Steve had just retired as U.S. Fish and Wildlife Service Region Eight Manager – California and Nevada. He has been intimately involved with the water issues confronting the Klamath Reclamation Project. On this day, high winds were ripping across the basin. Digital audio repairs allow Steve’s speech to be shared with a minimum of wind and flag flapping distractions. Anders apologizes for the audio quality but the speaker’s intent is important. Two Refuges interconnected and seperated by a ridge.